There really is nothing here that you might describe as a minus point. The warm welcome, the more than fully equipped apartment and the view at all times of day is just perfect. 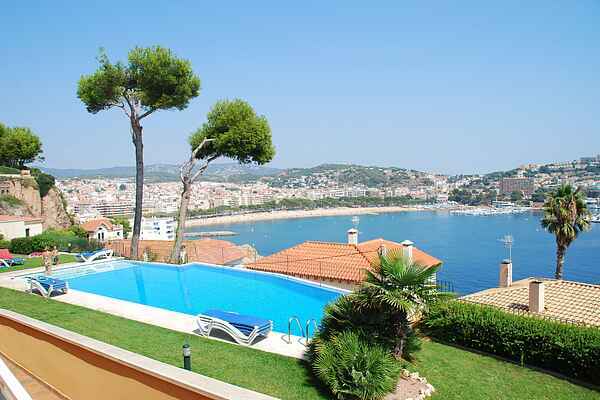 Due to the fact that you look out over the Mediterranean Sea and the town of Sant Feliu De Guixols. This attractive apartment with its modern decor and furnishings, situated on the outskirts of Sant Feliu, is just 500 meters from the sea and the sandy beach. There is a sliding door to the partly covered terrace. If you like you can go for a swim in the shared swimming pool with its sunbathing area and sun loungers People very much appreciate the peace and quiet at the apartment. If you fancy an outing with the car then s'Agaro (1.5 km) is your first stop; a beautiful bay that is much loved by Spain's well to do. A bit further along you will find the lively Playa de Aro (5.5 km). Prefer to go for an beautiful walk? The surrounding area is perfect for this.